The Brave Tour is our “show on the road” to elevate and enliven the conversations we have at work about leadership, partnership and courage. There are 3 events at every stop of the tour--come to one or come to all! 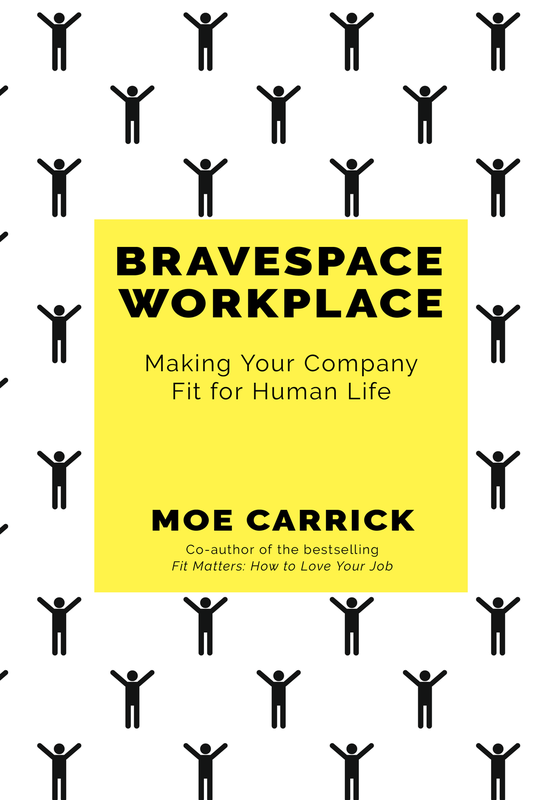 We will be launching Moe’s newest book, Bravespace Workplace: Making Your Workplace Fit for Human Life. The Brave Tour will have at its core a 4-hour workshop for leaders at every level exploring the human needs that work fulfills and the five levers for making your workplace one where people can show up as they are, both worthy and flawed, and do great things together. In this interactive workshop we will identify strategies for activating, enlivening, and tenderly supporting the complex humans who work for you so that they can bring their complete selves to your organization every day. Women can and do change the world. And today’s geopolitical climate has activated and enlivened powerful and hard conversations that matter between and across all dimensions of difference. As a white woman and a woman of color, we at Moementum seek to understand more about partnership and problems between women like us at work. While there have been improvements in the status of women globally, we still have a very long way to go, and white women have benefited disproportionately from the women’s rights movement of the last 150 years. Racial tensions are out there, and white fragility is real, and we have work to do. Eventually, and as a result of these listening sessions, we envision a new workshop and conversation between white women and women of color that tangibly provides tools and skills for finally elevating all of us together. We want to Get It (Together) in the truest sense. We want to get into real partnership. We want to get honest. We want to get real. We want to get through the dark middle. We want to get enlivened. We want to get healed. We want to get equity. We want to get each other. We want to get messy. We want to get the hand we also want to give. But before we want to offer solutions, we want to listen. Hard. Deep. Fast. With curiosity and to understand. So, while we are on the Bravespace Tour, we are hosting structured dialogue sessions for white women and women of color to explore how we work together and where we don’t; what gets in the way; where it hurts; where it works. These 3-hour sessions will be structured and facilitated with appropriate boundaries for safety even as they invite courage. We won’t be offering solutions or ideas or tips or tools or anything tangible to take away. We expect to end them with more questions than answers. We agree to tolerate the ambiguity and confusion we may open up. Who we are is how we lead. Awesome and scary as heck. People know their company through their relationship with their immediate boss. So whether you have one employee or hundreds, the call to bring your full self to your work as a leader is urgent and critical. In order to create bravespace workplaces of tomorrow where people can bring their full selves to work, leaders at every level need to up their game. This two-day workshop, Dare to Lead, is an empirically based courage-building program based on the most significant findings from Dr. Brené Brown's latest research which points to the fact that courage is a collection of four teachable, measurable, and observable skill sets. This interactive, engaging, and potent workshop will invite participants to deepen their ability to move from armored leadership to daring leadership in any arena. Local facilitator Moe Carrick, renowned for her consulting skills to organizations, her energy and her practical style, can also prepare participants to become Dare to Lead certified through attendance. Upon successful completion of the training and an exam, certified facilitators are authorized to issue Dare to Lead Trained certificates to individuals who successfully complete the full 16-hour training. In addition to receiving a certificate of completion, these individuals are allowed to put a Dare to Lead Trained badge on their LinkedIn account. Further information is available at daretolead.brenebrown.com. The combination of Brené Brown's tool-based, empircally-based curriculum and Moe Carrick's savvy business context and high energy make this an exceptionally rewarding workshop. Join Moe for this immersive and abundant workshop exploring concepts that allow us to lead with heart and mind in the fullest sense.